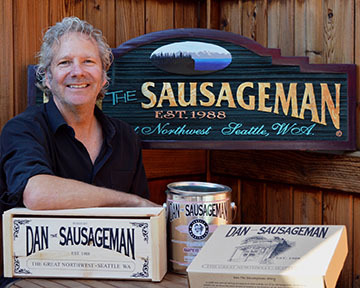 Dan The Sausage Man is the SBA Washington State Small Business Person of the Year! BURIEN, Wash.—Dan House has always been able to connect with people, but that skill became a huge asset about 30 years ago when he started selling sausage and jerky door-to-door. Over the years, they’d talk about their lives—kids, cars, vacations—and their businesses as well. “I learned so much,” House said. House thought the door-to-door gig would last a couple months, tops. 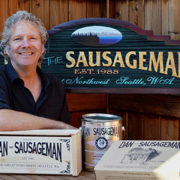 Instead, he said, his route around the South Puget Sound in a battered Dodge Dart became so profitable that he was able to open his own sausage company that eventually combined door-to-door sales of sausages and gift boxes with a retail shop and online sales. Dan the Sausageman also became a regular feature at community events and fundraisers in and around Burien. House has donated thousands of dollars in cash and products to support local schools and other non-profits. Each year he gives scholarships to two high school graduates who plan to attend trade schools. At first, House stored inventory in his garage, and then in rented space, but in 2004 he worked out a deal with the owner to buy the old Hi-Line Tin Shop at 923 SW 152nd St. in Old Burien, about two blocks from Burien Lake. He created a small retail space and storage area in part of the building, and used the rest, about 1,800 square feet, to create the Tin Room Bar, in homage to the oldest ongoing business in Burien, the Hi-Line Tin Shop, which opened in 1930. 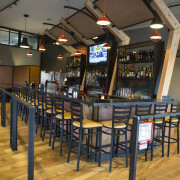 When the Tin Room and the sausage company outgrew their space, House took the sausage company off-site, expanded the restaurant and added a movie theater in 2010. All of that, he said, he did with handshakes, credit cards and help from friends. An entrepreneur accustomed to being resourceful and making things work, House said he has avoided working with banks as much as possible. “To be honest with you, I don’t like banks,” House said, and laughed. “Banks have not been kind to me.” The problem, he said, is that they don’t take the time to understand his business or its growth potential. House had to get over this feelings about banks when an under-utilized property on the same block as the Tin Room came up for sale in 2017. At the time, his online business had exploded and after being a sole proprietor for 27 years, he’d had to assemble a staff of nine to keep up with demand. He also needed space for a distribution center. House said he loved the idea of renovating another property in Old Burien and he thought the property at 901 thru 907 SW 152nd St. would be perfect for his expanding gift basket business. House contacted a loan officer at Bank of America who suggested applying for an SBA 504 loan. Elizabeth Stevens, a senior loan officer with the Northwest Business Development Association which administers the 504 program, referred him to the Washington Small Business Development Center (SBDC) for assistance with his loan application. The Washington SBDC is a network of more than two dozen business advisors and two export advisors who work with small business owners who want to start, grow or transition a business. The Washington SBDC is hosted by Washington State University and is funded by the U.S. Small Business Administration (SBA) and one-to-one match from state and local sources. The Washington SBDC office in Des Moines is hosted by Highline College and receives support from the Soundside Alliance and surrounding communities. House started working with SBDC business advisors Rich Shockley and Jennifer Dye in early October 2017. At first, he said, he was a little skeptical, but after his first telephone conversation he was won over. 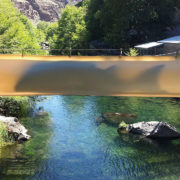 Together, House, Dye and Shockley created spreadsheets breaking down his company’s revenue and expenses over the past six years, and other spreadsheets projecting growth four years into the future. “Between Elizabeth, Rich and Jennifer, I felt I was not going it alone,” House said. 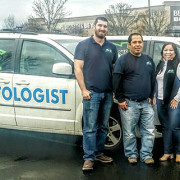 When the loan officer requested additional information, House said, “Jennifer and Rich just kept coming up with answers.” Since they understood what the bank was asking for, House said, they were able to help him dig through his financial statements and respond to requests efficiently and effectively. “All of them were in my corner, finding a way to make this happen,” House said. 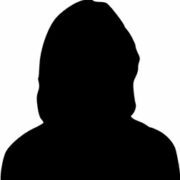 In the end, House qualified for a $750,000 SBA guaranteed loan with 10 percent down and was able to complete the purchase by late November. Renovation on the building will begin in February, House said. He hopes to open in late Spring to sell Dan the Sausageman gift boxes and summer sausages. The site will also be a distribution center for his online sales. Even though the sale is complete, House expects his relationship with Dye and Shockley at the Washington SBDC will continue as he works to grow his business. “They are everything that you would want when trying to grow, need advice or are applying for a loan” he said. 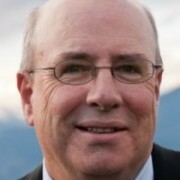 For more about the Washington SBDC, go to www.sbdc.org. http://wsbdc.org/wp-content/uploads/2018/04/Dan-House-Sausageman-5x4-web.jpg 288 360 Cindy Doyl http://wsbdc.org/wp-content/uploads/2014/03/WSBDC-LOGO.jpg Cindy Doyl2018-04-02 20:36:402018-04-02 20:40:00Dan The Sausage Man is the SBA Washington State Small Business Person of the Year!